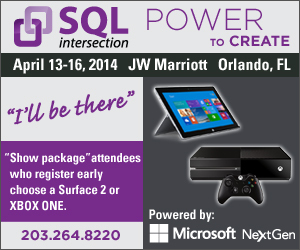 This year the Spring 2014 SQLintersection Conference will be in Orlando, FL at the JW Marriott Grand Lakes from April 12th to April 17, (including the pre-con and post-con workshops). There will be an informal “Ask the Experts” area with many of the speakers, including two Microsoft Premier Field Engineers, – David Pless and Tim Chapman. The idea is that you can bring your own problems and network with other attendees and speakers in smaller, more relaxed setting, where you can actually spend some quality time with the experts. There are a number of separate, practical tracks on each day for the conference, including things like Performance, Query Tuning, SQL Server 2014, BI Development, Platform Development, Statistics, Workload Analysis, Database Development, Programming, Troubleshooting, Hadoop & Riak, Indexing, and Core Administration. There will also be a number of sessions from Microsoft on In-Memory OLTP in SQL Server 2014, aka “Hekaton”, which I think will be very interesting for a lot of people. You also get to pick and choose from any sessions from the five co-located conferences on SharePoint, ASP.NET, Azure, Visual Studio, and AngleBrackets while you are at this conference. Early Bird Bonus: If you register for a Show Package (which is the full conference plus one pre or post-conference session), by February 24, you will receive your choice of a Microsoft Surface 2, Microsoft XBox One, or a $300.00 gift card. Finally, if you use the discount code of SQLskills when you register, you will get $50.00 off of your registration. “So I challenge Oracle, since our customers are increasingly looking to In-Memory technologies to accelerate their business. Why don’t you stop shipping TimesTen as a separate product and simply build the technology in to the next version of your flagship database? That’s what we’re going to do. As far as Hekaton goes, it is definitely not vaporware. I have been aware of it for quite some time, but I could not talk about it until Microsoft announced it and demonstrated it at the PASS Summit 2012. Microsoft’s Dave Campbell writes about it here. The fact that Microsoft has actual customers already using the technology means that it will likely show up sooner than Oracle expects (not that I have any inside knowledge about that). So what does this mean to you, as you are busy running your current SQL Server infrastructure? Well first of all, keep in mind that Hekaton is targeted at very volatile OLTP workloads, where people are running into high latch waits as they try to insert many tens of thousands of rows per second into a table. It will let you convert individual “hot” tables into Hekaton tables that will have to fit into main memory on your database server. It is not clear yet how this will play with table partitioning. You will also be able to convert standard T-SQL stored procedures (that only use Hekaton tables) into compiled stored procedures that run much faster. Even though Microsoft has not officially announced it, you can bet that this will be an Enterprise Edition only feature. You should be looking at your server hardware to determine how old it is and how much RAM it can hold. You also should take a fresh look at server class DRAM pricing, which has fallen to extremely low levels. Server class RAM is really an amazing bargain! If you are running SQL Server Enterprise Edition, you don’t want to skimp on your RAM. It is pretty common in the SQL Server community to use the DRAM pricing from crucial.com as a benchmark for server class DRAM pricing. Currently, 32GB DDR3 ECC DIMMs still have a very substantial price premium, being priced at about $47/GB, while 16GB DDR3 ECC DIMMs are priced at about $15/GB. 8GB DDR3 ECC DIMMs are even more affordable at about $11/GB, but their lower capacity makes them much less attractive for database servers when you are trying to maximize your total capacity. Current two-socket servers that use the Intel Sandy Bridge-EP platform have 24 DIMM slots so they can support 384GB of DDR3 ECC RAM using 16GB DIMMs. They also have PCI-E 3.0 support. It would only cost $5760.00 to fully populate one of those model servers with (24) 16GB DIMMs. Based on TPC-E benchmark scores, Sandy Bridge-EP systems that have the Intel Xeon E5-2690 processor have the best single-threaded performance and give the best price performance for SQL Server 2012 OLTP workloads. I am predicting that we will see the follow-on Ivy Bridge-EP platform roll out in Q2 2013, with something like an Intel Xeon E5-2690 V2 processor. This should be pin-compatible with current Sandy Bridge-EP servers (such as the Dell PowerEdge R720 and the HP DL380 Gen 8), which will make them available in existing models even more quickly. By then, 32GB DRAM prices will probably be more affordable. Looking further into the future, the Intel Haswell-EP platform will probably be available by Q2 2014. It will be a full Tock release from Intel, so it will probably support even more memory with better memory controllers.